Impetigo is another highly contagious skin infection that likes to leave its mark. We all catch infections from time to time, but its particularly embarrassing when the infection leaves its evidence on your face. Impetigo can also appear on the arms, legs, and neck. Impetigo can infect anyone, two strains of bacteria (staphylococcus aureus and streptococcus pyogenes) that sneak into a cut or break in the skin. These breaks in the skin can be anything from an insect bite to skin damage from another skin condition like eczema. There are many types of impetigo, such as impetigo contagiosa, bullous impetigo, and ecythma. Although not serious, the symptoms of impetigo can last from two to three weeks. Fortunately, there are several home remedies you can try to alleviate some of the symptoms and try to speed up the healing time. Depending on how severe your impetigo is, it can be treated easily at home with a simply remedy and good hygiene practices. It is important to treat impetigo as efficiently as possible, as the infection spreads easily. Tea tree oil can stop the spread of bacteria dead in its tracks. Tea tree essential oil contains powerful anti-inflammatory and anti-microbial properties, which not only help treat the infection, but soothes painful inflammation as well. To use tea tree oil on your impetigo, blend a couple drops with one tablespoon of olive oil. Apply this blend directly to the infected area and let sit for a half hour. Once the 30 minutes are up, gently rinse off with lukewarm water. Use this remedy twice daily until the impetigo clears up. Manuka honey is a powerful natural remedy in that it contains healing antiseptic and antibacterial properties. Manuka honey will not only help treat the infection, but its antibacterial properties will also help prevent the spread of infection. This remedy is also good for expediting the healing time of your sores while ensuring the infection does not come back. To use manuka honey to treat your impetigo, simply apply some of the honey directly on the infection and leave on for a few hours. Rinse off with lukewarm water. It is recommended that you apply this home remedy a couple times a day until the infection clears up. If you want to give your immune system a boost while fighting the infection, you may also consume a tablespoon of manuka honey during infection. Grapefruit seed extract is an effective treatment for impetigo because it is loaded with antioxidants while the antibacterial properties disinfect that affected area of skin. To use grapefruit seed extract on your impetigo, simply mix a couple drops of the extract with two tablespoons of water. Dip a cotton ball into the solution and dab the cotton ball directly onto the infection. 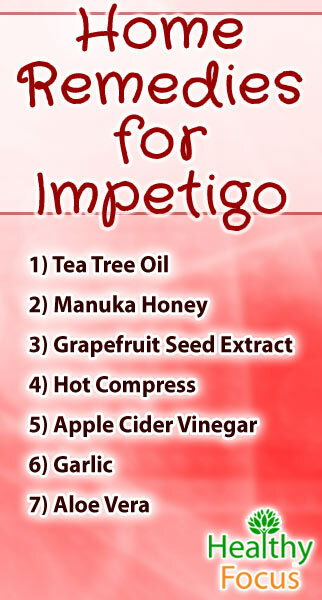 You can use this home remedy two to three times a day to treat your impetigo. If you notice some itching at the beginning of this treatment, do not be alarmed; it will subside and you impetigo will clear up soon. Applying heat will kill the bacteria responsible for infection while also drying up the pustules associated with impetigo. To make a healing heat compress for your impetigo, dip a washcloth in hot water and then wring out the excess moisture. Place the compress directly on to the infected area and leave on for a couple minutes. You can use this treatment several times a day until the infection clears up. If you do not want to bother making a hot compress, you can simply use a hair dryer on a low setting to cook your impetigo into submission. One tricky thing about impetigo is how easily it spreads if you do not take care to heal the skin lesions while disinfecting the skin. Fortunately, Apple Cider vinegar has you covered on both ends, making it an effective treatment for this infection. Apple Cider Vinegar (ACV) works as a sort of natural antibiotic without the harsh side effects of the real thing. To make a healing ACV solution, mix two cups of lukewarm water with one tablespoon of Apple Cider Vinegar. If you do not have ACV on hand—in this case regular white vinegar can also work. Dip a cotton ball into the solution and dab directly onto the infection area. You can use this remedy two to three times a day until the infection clears up. To double the impact of this home remedy, try applying an over the counter ointment after applying the vinegar and then covering up the infected area with a gauze. Garlic has a reputation for being an affective way to annihilate infection outside of the kitchen. Garlic will not only kill the infection responsible for the impetigo, but it will also help alleviate the painful itchiness associated with the infection as well. To use garlic to treat your impetigo, crush three or four cloves of raw garlic until it makes a paste. Apply the paste directly onto the infection and leave on for ten minutes. After ten minutes, rinse off with lukewarm water. You can apply this home remedy twice daily until the infection clears up. It is not surprise that aloe vera is on this list, aloe vera is a friend to the skin that fights virtually any infection that comes its way. Aloe vera is a great home remedy for impetigo not only for its healing abilities, but also because it contains antiseptic, antibacterial, and anti-inflammatory properties. This natural treatment is also loaded with antioxidants, which will help your body fight the infection. To use aloe vera to treat your impetigo, simply cut an aloe vera leaf and squeeze out the gel. Apply the gel directly onto the infection and leave on for a half hour. Use this treatment three times daily for a week. While fighting impetigo, take the following tips into consideration to speed up your healing time and prevent future infection. • Always keep the infected area and surrounding areas clean. • Try not to touch the infected area too often. • Do not scratch and pick at the infected skin. • Regularly wash your hands with antibacterial soap. • Regularly take warm showers and baths. • Do not share towels and linens. • To prevent the spread of infection, wash all clothes and linens in hot water. Then let them dry in direct sunlight to kill the bacteria. • Clean all surfaces of the home with antibacterial cleaning agents. • During the initial stages of infection until you get the impetigo under control, stay at home so you do not pass the infection along to others. • Drink lots of water to keep your body hydrated and healthy while fighting the infection.